What is the amount of penalties? The penalties for not paid road charge vary from 300 leva for a light vehicle up to 1800 leva for heavy gross vehicles. Starting from 2019 a compensatory charge is implemented where by determination of infringement it is possible to voluntary pay the use of the paid network without enforcing an act for determination of administrative infringement and without higher penalty being due – a fine. 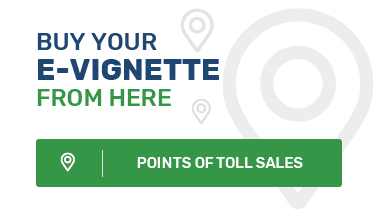 Which are the control bodies which will monitor the payment of e-vignette and toll? Control of the payment of vignette charges will be performed by the bodies of the National Toll Directorate, the Ministry of Interior, as well as the National Customs Agency in the cases where the vehicle leaves the territory of Bulgaria through the border crossing points. - by on-the-spot check when there are archived acts for that person in the system. By routine check or in case there are data available for use of the paid road network without meeting the obligation for payment of road charges during the particular travel or any previous travel – i.e. no payment is recorded in the electronic system of RIA.